For a long time now, Ducati has been perceived as a premium brand. Their motorcycles have always been priced on the higher side if not exhorbitantly, and it looked like cost effectiveness and affordability were words that never existed in the dictionaries of those making these achingly beautiful motorcycles in Bologna. Interestingly, when the Italian manufacturer launched the Monster 796 at a sticker price of Rs 8 lakh ex-showroom, they shocked a lot of people in the country. No one expected to see a sub-ten lakh rupee Ducati on Indian streets. But they did it. And today is a time when the Asian market is becoming increasingly important for everybody  manufacturers across the globe are keen on exploring the potential here. It is only natural for Ducati to focus on emerging markets in the Asian continent, and the Italian manufacturer has done something it has never done before  launch a market specific model in the form of the Monster 795. Shumi rode it in Thailand, and while initial impressions were positive, I decided to straddle the bike for a full road test. The Monster 796 is a definite looker and with an identical styling package, the 795 looks smashing from every angle. It has all the right elements to get you drooling  the round headlight upfront, delicately sliced by the strip of daytime running LEDs, the curvy fuel tank, the trademark red trellis frame, minimal bodywork et al. No prizes for guessing the biggest change though  Ducati has ditched its signature single-sided swingarm and gone in for a conventional double-sided swingarm for the 795 to cut costs. But that does not stop it from being a show stopper, and every traffic light that I stopped at while riding the 795, it ensured that all eyes were trained upon it. In fact, barring a few angles, the 795 can easily be mistaken for the 796. Other changes include the lower, smaller, 696 trellis frame and its components, three-spoke alloys from the 696 and a steel handlebar sourced from India itself. I have to admit here, that the steel handlebar feels totally out of place on the Monster 795 but it is one of the measures to make the motorcycle cheaper. The rest of the motorcycle feels just like any other Ducati and is as awe-inspiring and gorgeous as its siblings. So does the Monster 795 feel cheap? The answer is no. All the parts on the motorcycle are manufactured essentially at the Ducati factory in Bologna and are only shipped to Thailand for assembly. Fit and finish are near perfect and nothing on the motorcycle feels sub-standard in quality. The Monster 795 uses the same 803cc, 90-degree V-twin, air-cooled engine as the Monster 796. Power and torque figures are identical - 87PS at 8250rpm and 78Nm at 6250rpm, which is what makes this motorcycle a real Monster. To give you perspective, the Monster's dry weight equals the Honda CBR250R's kerb weight. Get the picture? A mind-blowing power to weight ratio of 520PS/tonne! The engine lays down its power with such urgency that a full-bore launch will see the tachometer hit its redline before you can think. And this is one engine that loves to be revved hard  try riding in any gear below 3000rpm and she revolts by juddering continuously, begging to be revved. Being a V-twin, the Monster 795's torque curve has an even spread  it pulls seamlessly all the way to the redline in every gear, without any sudden dip or surge. This makes the bike extremely rideable in the city and all that an overtaking manoeuvre requires is a twist of the wrist. If you fancy hoisting the front wheel up like me, all you need to do is chop throttle in first gear and then whack it open. The bike responds instantly and before you know it the front wheel is pawing air. But there's a small catch here  just like every Ducati, the 795's ECU is programmed to cut fuel supply instantly whenever it detects high revs at low speeds. As a result, clutch wheelies are very difficult to perform on the Monster 795 but the engine is more than eager for power wheelies and offers you all it has for the purpose. This engine is a brilliant performer, and the Monster 795 is happy doing whatever it is asked to  you can cruise at 120-130kmph without thrashing the engine, or ride it like a maniac revving it hard. Both Shumi and I were raving about the Monster 796's performance on track after we rode it at the Chennai race track, and I am sure the 795 should be equally fun to ride on a race track as well. The six-speed gearbox shifts precisely, and each shift comes up with a positive click. The 795 impressed me with its performance in our tests, achieving the 0-100kmph feat in a mere 4.27 seconds. Top speed achieved was 193.3kmph on the VBox, but even as I backed off, I knew the bike is capable of hitting about 210kmph before running out of steam. The quarter mile figure was achieved in 12.54 seconds at 175.46kmph, a respectable figure from an 800cc naked. Roll-on acceleration times are impressive too. The Monster accelerating from 30 to 70kmph in 4.75 seconds in third gear, and from 40 to 100kmph in 6.96 seconds in fourth gear, the number increasing to 8.14 seconds in fifth. Twin 320mm Brembo discs up front ensure the Monster stops quickly whenever you need to, coming to a full-stop from 100kmph in 3.4 seconds, covering 52.16 metres in the process. While most Monster owners will not really bother about fuel efficiency, the Monster is frugal enough to keep you wanting to ride more. In the city run she returned 15.12km to a litre of fuel, the number stretching to 18.86kmpl on the highway. This translates to an overall figure of 16kmpl and with its 15-litre fuel tank the Monster will do about 240km on a full tank of fuel. Ride quality on the Monster 795 is on the stiffer side. Its suspension lends a sporty feel to the motorcycle, which inspires you to ride it hard. The 43mm, upside-down Marzocchi forks at the front and the preload and rebound adjustable Sachs monoshock at the rear work well, allowing you to enjoy every moment on the bike. The bike loves being tipped into corners, and encourages corner carving antics. When ridden fast on bad roads the sporty suspension feels stiff, though at lower speeds it soaks in the undulations. On a race track, I am certain that scraping your knee sliders will not be much of a task on this motorcycle. A typical streetbike in nature, it feels nimble and flickable thanks to the light front end. It is shod with lower spec Pirelli Angel tyres at both ends which according to Ducati are supposed to last longer than the Pirelli Diablo Rosso rubber the 796 gets. But do not be mistaken  the lower spec rubber does not rob the Monster of its fun factor, and offer loads of grip everywhere. I have always been a fan of the Monster's handling package and the 795 performs brilliantly in this department. Direction changes are effortless and the wide handlebar makes it comfortable to ride in whatever condition you choose. High speed lane changes are never a problem either and the feedback from the front end combined with the zippy power delivery lets you slice through traffic effortlessly. Seating position is lower on the 795, since saddle height is lower than the 796 by 30mm, apart from the handlebar sitting 20mm lower. As a result, the 795's riding position feels more relaxed than the 796 and feels more comfortable, which should make it an ideal motorcycle for long rides too. However the only glitch here is that the 795's seat is a tad too soft for my liking, and after being in the saddle for a while I felt as if I had sunken into the seat. The Monster 795 gets the full set of instruments as the 796. The all-digital dash incorporates a speedometer, tachometer, tripmeter, clock, maintenance warning, oil temperature, fuel tripmeter, lap time recorder, warning light for low oil pressure, low fuel light, shift light and immobiliser apart from the usual tell-tale lights. The system is also ready for connecting to the optional DDA (Ducati Data Analyser) system. 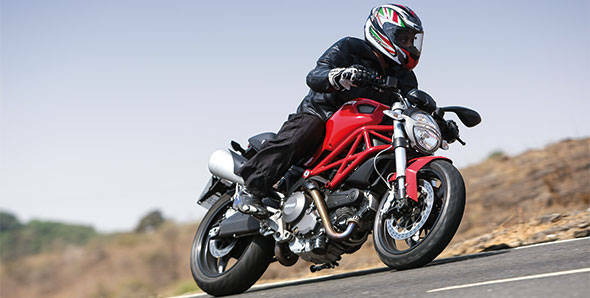 The Monster 795 is Ducati's first attempt at increasing its market share in emerging markets such as Asia, where the middleweight displacement motorcycles, streetbikes especially are becoming increasingly popular. A true blue Ducati at heart, it has all the right elements, in the right measure, that make for an engaging experience every time you hop on. Its lightweight, performance-oriented theme makes it highly desirable as an everyday motorcycle. Despite being assembled outside Italy, fit and finish levels are impressive, and it doesn't feel any different from other Ducatis. It has to make do with cheaper parts but these hardly rob you of the feel of a Monster. And most importantly, at Rs 6.09 lakh,ex-showroom Delhi it does not burn a hole in your wallet. Its nearest competitors are the Kawasaki Ninja 650R and the Hyosung GT650N, and despite being more expensive, the Monster 795 is a lot more fun and involving to ride. In the Monster 795 Ducati already have a winner on their hands, since nothing comes close to the Ducati experience.